Will the Gods of Golf Grant Tiger a Kiss Goodbye? When I was head of talent recruitment at IMG for Mark McCormack, I had 600 files on all the gifted high school and college kids as well as an international network of scouts keeping an eye on exceptional talent. Mark was “pissed off” that he had missed Seve. He didn’t want that oversight to happen again. For my first-year recruiting, and having spent 10 years on Tour, I thought I knew what I was doing. I went for talent, the purest ball strikers, the shot makers, the magicians around the greens. I stood on the practice tees for hours and at college events while zoning in on my targets: male and female athletes. It took me a year to work out that I had, in fact, gotten it all wrong. I learned this from Corey Pavin, who in the words of my father in the old days, “couldn’t beat his way out of a paper bag” on the range. I took Corey to dinner and asked him how he thought he was going to do on Tour the following year. He turned with fierce eyes and said, “I am a five-foot-eight-inch Jewish kid from New York that is going to win more money that any rookie has ever won next year”. I signed him up immediately, finished my visits of practice grounds and took my candidates to dinner instead to rate their “desire factor.” Corey went on to win the PGA Tour money list in 1991. 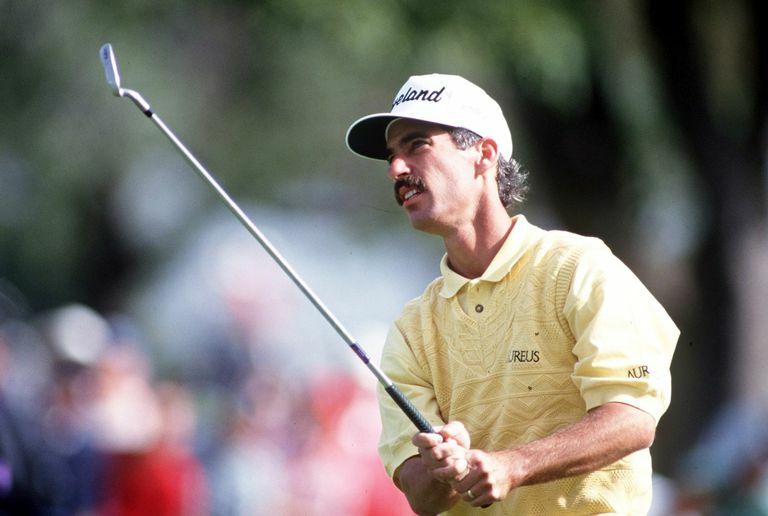 Corey Pavin was one of the shortest hitters on the PGA Tour during his heyday in the 1990s, but his accuracy and short game helped him win more than a dozen times, including a U.S. Open title. I had worked out that 7.5 out of 10 “talent” with 9.5 out of 10 “desire” kills the 9.5 talent with 7.5 desire in the long term. It’s ALL about DESIRE. Who over the years have had the strongest “desire.” Just look at the record books. Probably the winner over all is Gary Player because he was, by far, the least talented of the greats” Hogan, Sarazen, Snead, Nicklaus, Watson, Palmer and, of course, Tiger. Gary Player and Roddy meet again at The Golf Writers Dinner during the 147th Open Championship at Carnoustie Golf Links. Tiger wins the “most talented” category and would be equal or maybe a fraction ahead of his peers in “desire.” When I speak “desire,” I mean obsessive, compulsive and the relentless single-mindedness to achieve their goals. As a child and during his time at Stanford, Tiger’s eyes never strayed from the prize of being the world’s greatest. It has been mesmerizing, thrilling and spectacular to watch Tiger’s career over the years. Especially this final chapter when he tries to do a “Lazarus” and rise from the grave of golf. It’s the burning, insatiable desire that drives him against all the physical and mental odds, many self-imposed, that are stacked up against him at 43 years of age. He has had to learn humility and humbleness and adapt the way he sees the world or the way his father taught him to see the world. It has been a roller coaster ride the likes that no other golfer has ever experienced Yet, he still fights on while relentlessly regaining the respect and love of the multitudes that now follow him faithfully. They want him to win, they want him to win more majors, they want him to beat Jack’s record! 32 Majors championship and abundance of respect between these two. Jack Nicklaus and Tiger Woods – the face of golf for the past half a century. The question is can he? In 2015 Tiger arrived at St. Andrews his favorite course and was confident he was ready for his comeback. The Old Lady of St. Andrews had different ideas and sent him packing on Friday when on the very first hole he duffed it in the Swilken burn. It was a devastating reminder of how cruel this wonderful game can be. It was also a notice that his time in purgatory was not yet over. He got another early slap in the face at the U.S. Open at Shinnecock in June earlier this year. Now for the first time he looks right. He has been through the crazy coaches and has reverted and adapted to how he plays best, how he used to play. Now it’s all about the mind and the games that are going on up there. He showed at Carnoustie that he is nearly there. He achieved his goal of getting himself into contention with nine holes to go. He looked a bit lost then when the gloves were off and had to close. He was also, perhaps, a little unlucky to have the Hogan-like Molinari behind him. Last week in Firestone the game dealt him another minor setback. He was off-track all week. In the past, he used this to motivate himself. This week he heads off to Bellerive Country Club in sweltering St. Louis for the final major of the year: The PGA Championship on the “green monster” course. It will suit him as it is not long, but strategic. Straight hitters have done well there. He will be able to plot his way around. The problem for him now is that the other top players no longer fear him. They will be firing fearlessly on all cylinders hitting drivers and scoring low. Maybe too low for Tiger. It’s hard to see how he can beat Johnson, Thomas, McIlroy, Molinari and Day on an “All American” course like this. But with Tiger you never know. He did it in 2000 and again in 2005. What a story it would be if Tiger was to make it three-in-a-row on a historic return to The Old Course St Andrews for the 150th Championship.